I'm planning a family trip to Canary Islands in the second half of September. For now, Tenerife seems like the most likely destination. I've read that fruits like cherimoyas, pineapples, papayas, mangoes and bananas are grown there in abundance, but I couldn't find much about jackfruit, sapodilla, mamey, white sapote, dragon fruit, eggfruit, rollinia, lychee, longan, mangosteen etc. I've seen some YouTube videos from markets, but I saw prices like 6.5 EUR per KG of dragon fruit, which made me think it was imported rather than grown locally. So my question is, does anyone know if these fruits are grown in the Canary Islands, and if yes, where can they be found and which time of year? In general, what is the best place to go and taste exotic fruits in the Canaries, and is there a fruit farm where you can go and taste fruits off of trees. And one final question: what time of year does cherimoya season start? Is the end of September / beginning of October too early? Hi, jackfruit, sapodilla, mamey, white sapote,dragonfruit, eggfruit, longan are hard to find. Your best bet is the market of Santa Cruz. Never found rollinia or mangosteen. Lychee should be available but never saw it. Try the yellow dragon fruit grown locally. If you go for tropical fruit, then Tenerife is the best island and September is probably the best month, because most of the fruit will rippen in this month. Close to sea level you can grow anything except of ultra tropicals: no durian, mangosteen, rambutan, pulasan, Mangifera caesia, chempedak, etc. All other ssp. you mentioned do fine. Commercially grown are: pineapples, papayas, mangoes, bananas, dragon fruit and guanabana in smaller scale. Other fruit is grown and sold locally. That sounds amazing. Is it possible to visit your farm? Thank you guys, this is some great information. Felipe, I would also be interested in visiting your farm if that's possible. Here is a nice breadfruit tree on the SW coast of Tenerife: https://www.palmtalk.org/forum/index.php?/topic/3728-artocarpus-altilis/&do=findComment&comment=63507]. All of those ultra tropicals are probably worth a shot too, especially on the SW coast. We have tried over the years many exotics here and I can tell you, ultratropicals do not work over here. I have wasted a lot of money and affort. Hundrends of failures. A friend managed to keep a mangosteen alife in a heated greenhouse. I did not die, but neither did it grow. Same thing with rambutan with another friend. There is yellow mangosteen in the botanico in Puerto. In Borneo in the village of Rundum i saw rollinia, abiu, Garcinia forbesii, tarap and even fruiting durian. Elevation 1200 m, day temperature in February around 11C, felt like the highland of El Hierro, most ultra tropicals dont grow there but i think most of the fruit i saw there could do well in the Canary islands. Yes, g. Xanthochymus and livingstoneii for example fruit well here, but not others like mangosteen.. In rundum day temperature around 11 celsius?! Wow.. that is the lowest i have ever had.. well but there are other factors. IMO the most important factors for ultratropicals are high temperature and small fluctuations, high humudity and low ph. Probably the climate in rundum is very humid, right? Its the opposit in my location..
Did you manage to fruit chupa chupa tree at your location ?. I remember you posted a picture of this tree long time ago and I'm wondering how the tree is doing right now. 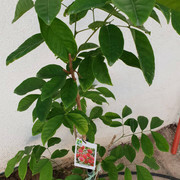 BTW, have you tried to grow Pometia pinnata (Fiji longan/matoa) and Xanthophyllum amoenum ?. Are coconuts considered ultra tropical? I didn't see them mentioned in relation to Canary Islands anywhere. If no, can you get fresh coconut there somewhere? Temp fluctuations are quite small in Borneo but in the dry season ( they call it summer) its supposed to be hotter. And Rundum is very wet. I would not give up on the ultra tropicals, though. One example: in Germany Eryobotrya usually comes from the Mediterranean. Trees fruit once in about 10 years and freeze once in about 10 years. There is a pretty large Eryobotrya tree in Heidelberg that fruits every year. When i asked the owner where its from he said from Brazil. Coconut trees are common in the Canary resorts but fruit are often small, sometimes without flesh or even a hard shell . The tourists pick the ones on low trees while unripe. I have already written in this forum that I had the chance to eat many kilos of excellent tasting chupa chupa in the Peruvian Amazon (they call it sapote). It is still in my top 10 fruit list (or even top 5), but my tree had no good genetics. If I get one day again good material, I would try again. I once ordered Pometia pinnata seeds, but they unfortunatelly did not grow. I think this sp. should do fine in the subtropics. Do you have experience with any of those? Loquat in Heidelberg? I have also heard of pommegranates and figs acclimated in Germany. I agree that you have to try. To be honest I have been surprised several times because ssp could get acclimated to our region. for example Anacardium excelsum from the swamps of Panama. I will keep on trying with new things, but not waste more time with durian, mangosteen, etc..
Loquat is not uncommon now but only as an ornamental. Figs are a standard fruit tree in the area, good fruit if there is no rain. Pomegranate fruits well in sheltered locations but the fruit are quite sour or bland, good fruit quality only in very hot years. People here experiment also with lots of other mediterranean/ subtropical stuff. Pity i can only grow traditional fruit if i want to receive government money. Governmeng money? You mean subventions for commertial orchads? Sorry to hear that, Felipe. I have only tried Pometia pinnata and Quararibea cordata. In fact, I received my Quararibea cordata seeds about three months ago, it took about 2 months to arrive to me from Costa Rica and I managed to germinate almost all of them. It seems like it can handle my city water and a temperature about/above 10C. As for Pometia pinnata seeds that I got from Malaysia. The package took more than I expected, around 45 days , usually it takes around 10 to 15 days. Anyway, i should have 2 to 4 seedlings if everything goes well. These seeds are really very perishable. I tried to grow it before but failed, so this is my second try.